Welcome to I See Me! where we provide the highest quality, most personalized children's books available. We opened for business in May of 2000, after a year of active product development. My husband Allan and I received a personalized book as a gift for our first son in 1998. While we loved the fact that it was personalized, we thought that the illustrations could have been much better and the story more customized to the child. Thus I See Me! was born. Allan, who is a graphic designer, and I developed the first book My Very Own Name as a team. Our goal was to produce an educational book that would teach young children how to recognize letters and spell their names. After I developed the concept and wrote the book, we brainstormed together to develop the characters in the book. Allan found and hired the illustrator, and designed the book, while I wrote the business plan. We are pleased to say our books have become popular among celebrities including Courteney Cox, Brooke Shields and Jessica Alba. Our mission is to increase self esteem in children through personalized books that celebrate the uniqueness of each child. The goal of our books is to show each child how absolutely unique and special he or she is, to teach the child how to spell his or her name, and to build vocabulary skills. We hope that you enjoy the books! --Maia Haag, author and CEO of I See Me! Inc.
A Christmas Bear for Me is a precious story about a child's Christmas wish for a special Teddy Bear friend. This personalized storybook captures the anticipation leading up to Christmas morning and the magic of receiving a special gift from Santa. Your child is the "star" of the Christmas book and his or her name is featured throughout story. Your child's name and the names of his or her siblings or relatives are incorporated into intricate illustrations of stockings across the mantle and Santa's list of who has been good! It comes with a cuddly, mini 6" Gund plush bear and a personalized letter to the child from Santa. I See Me's A Christmas Bear for Me Book is so cute! On top of the book being so cute it comes with the cutest, softest little bear. 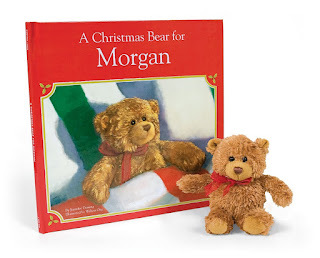 A Christmas Bear for Me Book also comes with a personalize letter from Santa which my kids absolutely love. Anything from Santa is cherished in our house this time of year. I love, love, love that you can add siblings names to the book. We added my girls names to the stalking over the fireplace on a page and on Santa's naughty or nice list. Of course they were on the nice list. My kids got such a kick out of this book being personalized for our family. This really is a very special gift that will light up any child's face. Such a perfect book this holiday season! Make your child the star of the tree with this charming personalized ornament featuring his or her name, photo and year given. Our personalized ornaments make a great add-on to any personalized gift order and will be keepsakes to treasure for years to come. 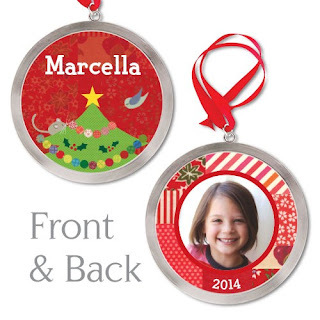 Ornaments are 2-sided and feature beautiful personalized images in a 3" silver plated ring. Ornaments come with a red satin ribbon for hanging. I See Me Personalized Ornament is adorable! I have this made with my six month old's picture and it will be something we cherish forever as this is his first Christmas. The ornament is two sided and silver plated which makes it sure to look absolutely stunning on anyone's tree this holiday season! I See Me offers something for everyone and every occasion. Be sure to check out some of their other products. Lunchboxes / Puzzles /Coloring Books/ Placemats / Stickers and Growth Charts! Click HERE to view I See Me's complete Christmas Collection. Click HERE to learn more about I See Me! Follow I See Me on social media!